All behavior serves a purpose, or "function." Behavior is a way to communicate a need. 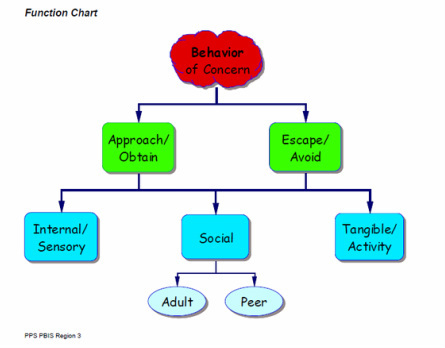 The behavior of concern is the student's best way to achieve their desired outcome. If it didn't work, they wouldn't have learned to do it! How do I figure out what the function is? Once all the assessment components have been completed, it can be challenging to integrate the information into a meaningful hypothesis statement. Here are tools to help. Summary of FBA Information - this is a part of the comprehensive FBA form. It requires each component be summarized into its most critical information in the form of an ABC statement. Then each ABC statement can be compared to find commonalities. Function Matrix - used to compile assessment components into a meaningful framework. Useful when there is competing evidence about the function of the behavior. Function Based Intervention Decision Model - All components of a behavior plan are important, but this decision flowchart will help you determine where to focus your time and energy. from Umbreit, J., Ferro, J., Liaupsin, C., & Lane, K. (2007). Functional behavioral assessment and function-based intervention: An effective, practical approach. Upper Saddle River, N. J.: Prentice-Hall. Is Power & Control a Function?